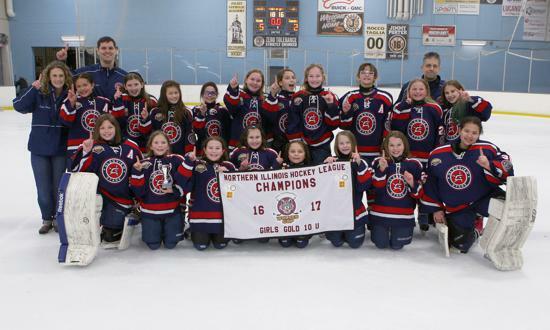 After a great weekend of Illinois State Hockey Championship round robin hockey, the Glenview Stars Girls U10, U12 and U14 teams all advanced to their respective State Championship games. The Stars coaches were impressed with both the work ethic and tenacity shown by all of our girls to fight through a tough schedule and emerge from their bracket headed to the finals. All three State Championship games will take place this Saturday, March 11 at The Edge in Bensenville. Please come out and cheer on the Stars as they battle for the State title. U10 Stars vs. Winnetka - 8 a.m.
U12 Stars vs. Winnetka - 9:30 a.m.
U14 Stars vs. Jets - 12:30 p.m. In the NIHL Wolves Cup, the Stars Girls U10 team bested the Sabres on Sunday evening to win the NIHL Wolves Cup Girls Gold 10U Championship. Congratulations Stars!